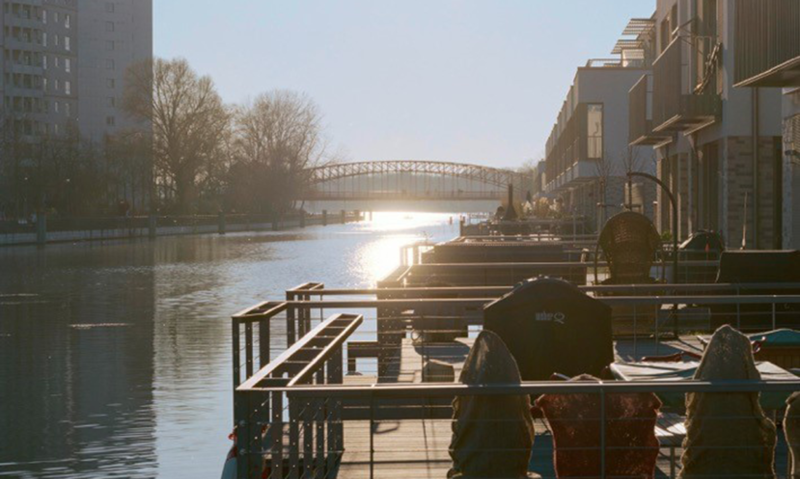 Exclusive living on the water without leaving the city – living on the waterfront has always been popular with Berlin residents. Although Berlin has a total water area covering 53 km² the habitable shoreline is limited. Humboldt Island is the only island in Berlin, where the residents have direct access to the water. Humboldt Island is an exclusive development in a park-like setting consisting of apartments, floating houses, town villas, as well as jetty duplex houses with waterfront terraces and private jetties. 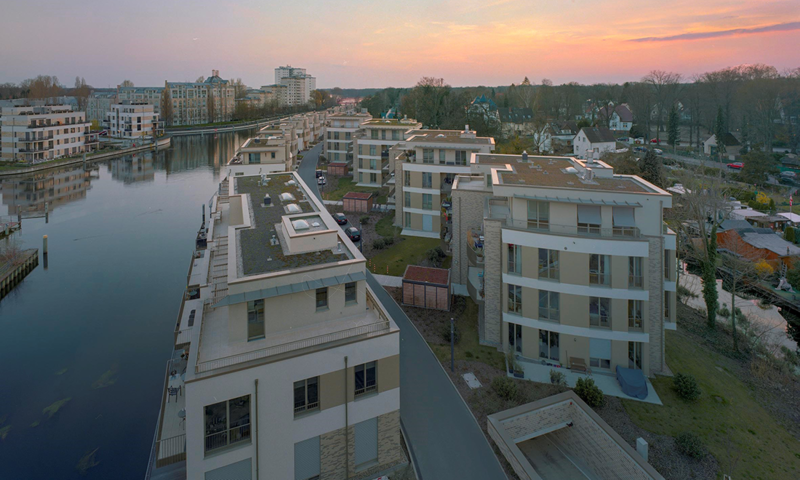 The magnificent interplay of nature, urbanity and waterfront living directly in Berlin makes Humboldt Island a prime residential location embedded in a private park-like landscape that entices with exclusivity and natural charm. 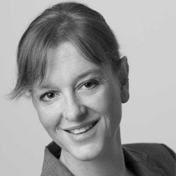 The development enables living in direct proximity to nature. The landscape design and central maintenance of Humboldt Island is handled by landscaping specialists. The result is a beautiful array of blooming shrubbery, flowers and extensive lawn areas in combination with Japanese garden elements. Humboldt Island is a project by MARTRADE Immobilien GmbH & Co. KG. Humboldt Island is located in the district of Tegel in the north of Berlin, one of the city’s most popular leisure and water sports paradises, an area rich with lakes, rivers and forests. The island, which is surrounded by the Tegel Forest, Humboldt Castle with its extensive park grounds, as well as the historic centre of Tegel has much to offer from a historical perspective – it is a prestigious city location that combines urban flair with nature. The island is encircled by the Tegel Harbour and the Tegel Stream, which flows into the Tegel Lake at its southern end. Humboldt island offers exclusive waterfront living along a 600 metre stretch featuring private water sports facilities in the immediate vicinity. The area is closely connected with the life and work of its namesake, Alexander von Humboldt. The postal address as well as individual landscaping details uphold the memory of the accomplishments of this world-famous Berlin scientist. Whether right next door or just around the corner – on Humboldt Island, the advantages of urban living and direct proximity to nature come together. Thanks to its lakes and the Tegel Forest, the district of Tegel is a paradise for nature lovers. The large stretches of water of the Havel river and the Tegel Lake with its many islands and beaches are among Berlin’s most popular water sports destinations. Water sports enthusiasts can travel all the way from here to the Elbe river, the North Sea, the Baltic Sea and the Rhine. The extensive forest areas are perfect for walking, hiking, jogging and cycling. Sailing marinas, rowing clubs, tennis courts, horse farms, golf clubs and many other sports and leisure facilities are located in close proximity to Humboldt Island. A good infrastructure ensures a wide selection of daycare facilities, schools and playgrounds in the immediate vicinity. The historic centre of Tegel has a large choice of cafes, restaurants and shopping opportunities. Those preferring all-in-one solutions will find what they’re looking for at the Hallen am Borsigturm Shopping Centre. Public transport is available within easy walking distance. Humboldt Island offers exclusive living with luxurious jetties, terraces overlooking the water and spacious rooftop terraces. The connection between water and land has been optimally implemented here. 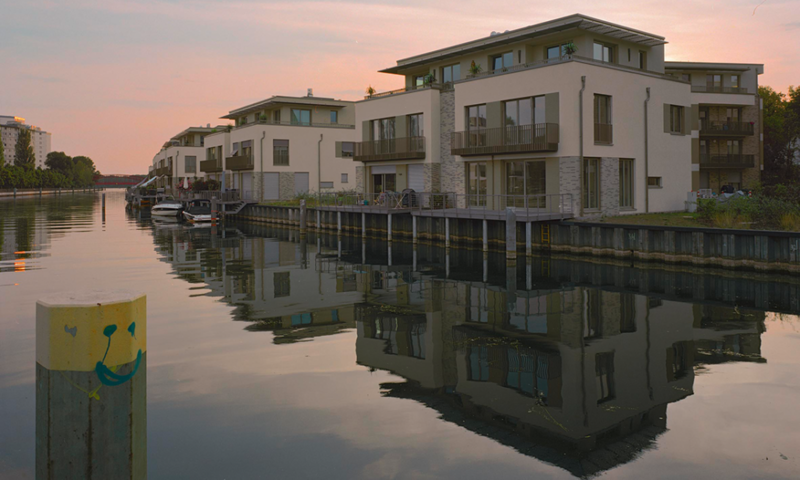 The living areas of the waterfront townhouses have been extended over the water in the form of terraces. The spacious floor plans with ceiling heights of up to three metres offer plenty of space for individual living directly on the water. Floor-to-ceiling windows further emphasise the closeness to nature. The underlying idea was to draw an arc through the gently rippling stream and the habitat that connects the site with the centre of Tegel. 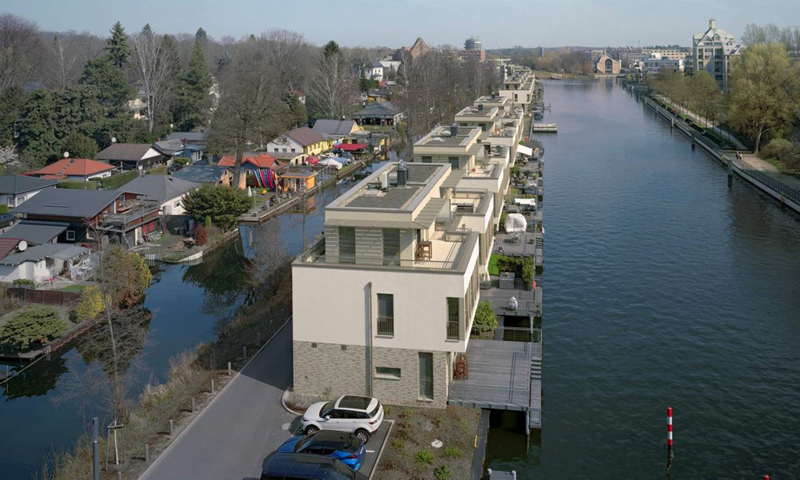 “The development was designed to draw together the different aspects of the island.” (Baumhauer Architects) The innovative energy concept with its own block heating station offers a coherent response to modern architectural demands.